Solomon's patronage of the gods of his wives led to his downfall and to the breakup of his kingdom. Putting wealth and cultural splendor before righteousness, he brought a heavy burdon on his subjects and the kingdom was ripe for rebellion. At his death, Israel's citizens, weary under the slave labor and heavy taxes imposed by Solomon's reign, approached his successor, Rehoboam with a request to lighten the heavy yoke upon them and they would serve Rehoboam if so done. Rehoboam, headstrong and foolish, took the counsel of the wrong advisors replying: " . . . My father made your yoke heavy, but I will add to your yoke; my father chastised you with whips, but I will chastise you with scorpions." (1 Kings 12:14) The rebellion was on! Northerners wanted no part of this man's rule. Judah and Israel were now antagonists and the two elements of the divided house were ruled by separate kings. The Period of Civil Strife - The strained relationship between the north and south had all the ingredients for a full-scale civil war. The inevitable was temporarily delayed by a prophet but war soon broke out and continued until the menace imposed by Syria upon both houses forced an alliance between the two factions. A royal marriage between the Northern king's daughter and the Southern king's son sealed the alliance and the civil strife came to an end. A Struggle to Maintain Unity - Jeroboam I felt compelled to de-emphasize Jerusalem as a worship center. Israelites going to Jerusalem, now in enemy territory, to pay homage to God might soon be wooed into the Southern camp. Jeroboam I perceived that maintaining a unity of worship would disrupt his ambitions for a separate kingdom so he established rival shrines at Dan and Bethel and ordered the people to worship there. The two golden calves set at opposite ends of the kingdom became an insidious influence which lured the people away from worship of the one true God. A Power Struggle Within Its Own House - Every king's life was threatened by power-hungry fanatics within Israel's own household. Since sovereigns were no longer annointed as had been in the days of the United Kingdom, the throne was usually occupied by murderers who would stop at nothing to rule the land. A Struggle Against Powers from Without - The South's king Asa, hard pressed by attacks from the North, called for help from Ben-hadad of Syria who was delighted by the invitation and ravished Israel. When the battle was over, this "power from without" stayed on the land and Israel's freedom was threatened by the Syrians from Baasha's reign through Omri's. Not until Ahab's reign was this foreign enemy vanquished and then not completely as Ahab allowed Ben-hadad to go free. Three years later, war with Syria broke out again! A Death Struggle with Paganism - Ahab brought an enemy into the land which proved to be more devastating than Syria had ever been, BAALISM! This idolatrous king, with little concern for the Lord and his commands, married Jezebel and as a wedding present built an altar for her gods right in the midst of Samaria. As Baalism gained a solid foothold in Israel during Ahab's reign, God sent prophets to warn the "chosen ones" of the monster in their midst. Elijah castigated King Ahab and his wife, Jezebel, for their tyranny before God. A showdown between the Lord and Baal came in a demonstration to the populace that there is only one God worth following. Elijah's successor was Elisha and he took up where Elijah left off and brought about the purging of Ahab's house. These brave men denounced evil wherever they saw it and promised destruction and judgement unless there was a turning back to God. The way to healing was available to those who would repent. The Period of Wealth and Prosperity - With the civil war ended and the Syrian threat momentarily subdued, Israel's kings turned to domestic affairs. Advantageous commercial policies and Ahab's marriage with Jezebel of the rich kingdom of Phoenicia brought Israel some of the wealth experienced in Solomon's day. This wealth poured into Syrian treasuries during the reign of Jehoahaz but was returned when Jehoash obliterated the oppressors from Damascus and paved the way for prosperity which reached its height during the reign of Jeroboam II. Amos and Hosea - These prophets of God diagnosed Israel's age of gold as a time of great peril. Captivated by the glitter and splendor of its material things, Israel had gone spiritually bankrupt. Complacency, self-indulgence, social injustice, sexual immorality, corruption in high places, swearing, lying, killing, stealing, and murder were rampant in the land. The prophet wanted to stop Israel's descent and his rebuke was sharp and clear but all would be forgiven if Israel would only turn back to God. Israel paid no heed and the end was not long in coming! The Period of Rapid Decline - Anarchy followed the death of Jeroboam II. Zechariah reigned six months and was murdered by Shallum who within one month was murdered by Menahem. Powerful Assyria Arrives - The Assyrian nation concluded its domestic troubles and became the great world power of the day. Pul eyed the fertile crescent with envy and came to conquer it but was paid off by Menahem. The "pay-off-king" was succeeded by his son, Pekahiah, who reigned two short years and was then assassinated by Pekah. Pekah Sought Freedom through Military Alliances - Pekah joined with King Rezin of Syria and then approached Jotham of Judah who would have nothing to do with their alliance. The coalitionists attacked the South to bring Judah into line. Ahaz, succeeded Jotham, and, fearful for his life, listened to Isaiah but couldn't be convinced that "mere trust in God" would take care of his kingdom, a fatal move. 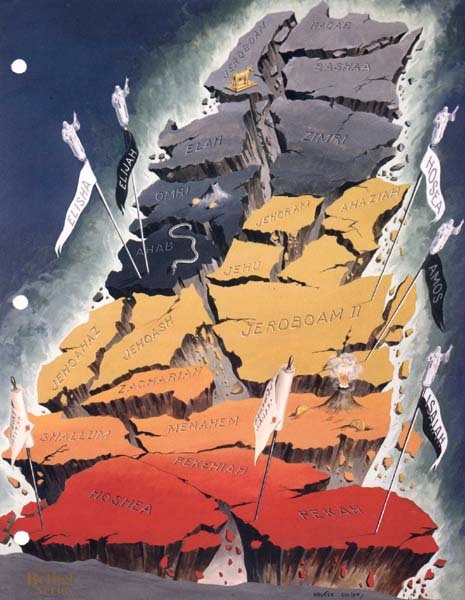 Assyria came with a vengence, ravished Israel, conquered Syria, and made Judah a vassal state. Pekah was murdered by Hoshea. Hoshea Sought Freedom through an Alliance with Egypt - Hoshea temporarily submitted to the Assyrians and their new King Shalmaneser V. Hoshea depended on an alliance with Egypt and withheld tribute money from Assyria. Retribution was swift and Shalmaneser cast the disobedient puppet king into prison. Samaria was put under a three year seige and was finally forced to surrender to Sargon, Shalmaneser's successor. The day of doom had come! The ten tribes of Israel were dispersed into the far corners of Sargon's vast empire and the Northern Kingdom came to an end. Dark section of crumbling earth (upper center) - Age of civil strife. Kings: Jeroboam I, Nadab, Baasha, Elah, Zimri, Omri, and Abab. Golden section of crumbling earth (center) - Age of wealth and prosperity. Orange and red section of crumbling earth (bottom) - Age of rapid decline. Golden calf on Jeroboam segment - King Jeroboam establishes religious shrines at Dan and Bethel in an attempt to de-emphasize Jerusalem as worship center. Volcano on Omri segment - Syria threatens Israel's freedom in reigns from Baasha through Omri. Snake symbol on Ahab segment - Baalism cult gains solid foothold in Israel during Ahab's reign. Elijah and Elisha banners on Ahab segment - These prophets denounce Israel's identification with Baalism cult. Prophet banners black and white - Prophetic voices make pronouncements of doom and hope. Amos and Hosea banners on Jeroboam II segment - These prophets warn against impending dangers of spiritual laxness in Israel during Jeroboam's age of gold. Erupting volcano on Menahem segment - Assyria becomes a violent threat to Israel's freedom during reign of Menahem. Two coins at base of volcano - Israel is forced to pay tribute money to Assyria to maintain semblance of peace. Manuscript peg on Pekah segment - Pekah seeks freedom from Assyrian threat by entering into military alliance with Syria to the North. Isaiah banner on Pekah segment - Isaiah cites futility of military alliances and prophesies destruction of the Northern Kingdom. Manuscript peg on Hoshea segment - Hoshea attempts military alliance with Egypt to rid Israel of Assyrian threat. Dark red color on Hoshea segment - Full-scale destruction comes to the North during Hoshea's reign. Overall portrayal of crumbling kingdom - Assyria destroys Northern Kingdom in 722 B.C.